are about the sum total of what Ralph can offer. Ralph thinks nobody can spot the dishonesty involved in attempting to rebut this evidence while refusing to reference any of it. Again, I'm more than happy for you to head over and read his piece because it's important to realize how Ralph operates. And as to your request for a screenshot of my Blogger account details Ralph, sure...maybe you'd like my bank login too? All you need to know is that today's numbers are way better than yesterdays. Ralph will try to confuse you by refusing to show the evidence I've provided. I've been very clear throughout in explaining how I arrived at my conclusion. He doesn't want you to know this. There are no rules about how the evidence should be presented except the imaginary ones he makes up to obfuscate ( see what I did there Ralph? ) the truth. Ralph thinks you are stupid. What he fails to realize is that the pattern is quite easy to spot once you know what you're looking for. Remember that we're looking at a blow up of a tiny, unfocused portion of Altgens. Remember that we've seen using Ralph's own photo that under those conditions we don't see crispness and clearness. Take a good look at the evidence here, then head back to Ralph's and look again. Much easier to see now, isn't it? He's spent two years hoping no - one would notice. In desperation Ralph moves to a tight crop but now he doesn't want to show you all of the area we're looking at in Altgens. You see, Ralph's quandry is that he doesn't want to show you this evidence on any of his sites because it's toxic to the O.I.C. This is a man who has previously stolen every piece of other's work he can lay his hands on, never giving the author credit and in some cases trying to pass it off as something produced by the O.I.C. Here, he won't even link to it. Once again, draw your own conclusions. "Mr. 19 says the pattern is easy to spot when you know what to look for. Then tell them what to look for. I don't mind that. But, don't mark within the area of examination. Did you hear what I said? I said: Do not mark within the area of examination." EARTH TO RALPH - I HAVE SHOWN THEM WHAT TO LOOK FOR. Nobody cares about your demands Ralph. I am free to present the evidence in any way I choose. Didn't Richard Hooke tell you exactly the same thing just recently? Don't mark the area of examination? Seriously? And that's just the first one I came across, there's plenty of O.I.C. stuff with so many markings you can barely make out the photo. ( And I don't mind showing that here, because of course if Doorman's shirt is patterned - and I've shown that it is - ALL the rest of it is irrelevant ). My presentations show the areas unmarked as well as marked. They make it very clear. Everyone is watching you lie about that. I can't see how you think that makes you look good but I guess it's your choice. Because even making Ralph demonstrate over and over again that he has nothing can get boring after a while. Pretty much too dumb to respond to. We all saw what you did with the cropping Ralph. To everybody else, just notice that Ralph is running through his old bag of tricks to avoid having to address any evidence. And notice how desperate he is to drag everything back to the old collage treatment, where he imagines he might have a chance to regain some ground. Not happening Ralph. No, I disagree, Lance. The Python sketch ( a classic!) is far more credible than Ralph's hackneyed tripe. Thanks for the excellent work ! "Old bag of tricks' is putting it mildly. The longest threads ever created at Deep Politics Forum was the "Fetzer/Cinque" fiasco. And if that isn't enough, the Judy thread at EF goes on for more than........ 200 pages. If these individuals are not doing this with an alternative agenda, then they are the some of the biggest fools God hath made. Forgive them, Lord, they know not what they do........ mehopes. 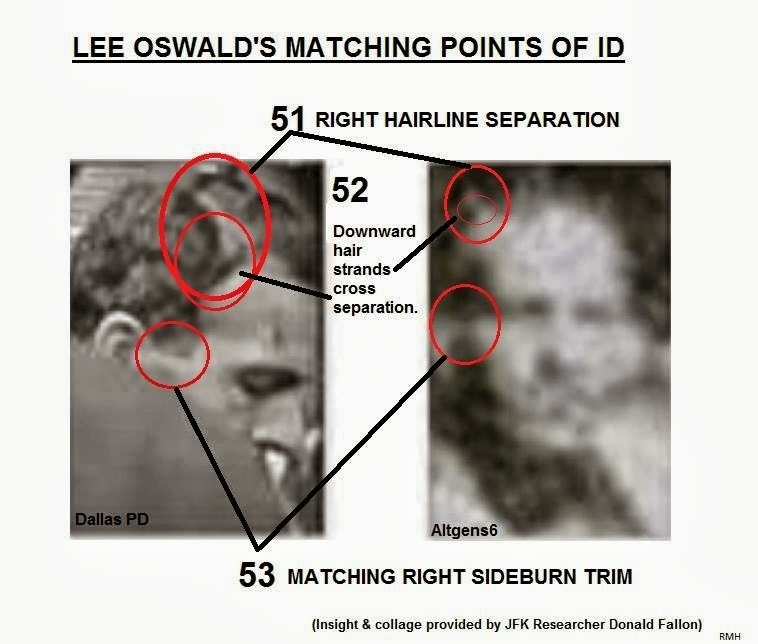 I think that there are probably a number of O.I.C senior members who support the broad notion of Oswald in the doorway but just don't keep up with what Cinque is pushing. The rest of them unfortunately know very well what they do, in my opinion.